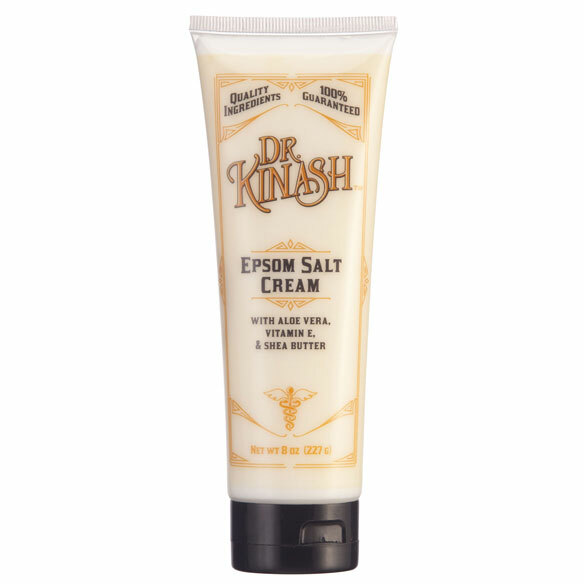 Dr. Kinash™ Epsom salt cream treats your body to the benefits of rich moisture combined with soothing Epsom salt. Perfect as part of your daily beauty regimen. This lightly scented skin cream contains aloe vera, vitamin E and shea butter to moisturize rough, dry skin from head to toe. Infused with Epsom salt, the moisturizing cream can help relax muscles and soothe aches, pains and soreness. Dr. Kinash™ science-based formulations and ingredients are trusted remedies with guaranteed results. Apply directly on areas of dry skin to provide moisture daily. I love this cream. I use it daily and it is very moisturize. Good for dry skin. Great for moisturizing and soreness. Like this lightly scented skin cream, it contains aloe vera, vitamin E & shea butter to moisturize rough, dry skin for my body. I have used it before and liked the results. Helps keep calf night cramps away at night. Previously used a Dr. Kinash product and interested in the other products.